NHLPA members have a little extra incentive for their hat tricks this season, and with an 11-goal week featuring a pair of them, Patrik Laine is cleaning up for charity. Laine (19-3–22) had a monster week featuring 11 goals to take the overall lead in the category this season. The young Finn bookended his week with hat tricks, the second of which was part of a career-best, five-goal night. Coupled with his first hat trick of the season (scored Nov. 1 in during the NHL Global Series scored in his home country, no less) that's a lot of hats thrown and $3,000 to the charity of Laine's choice – so far! 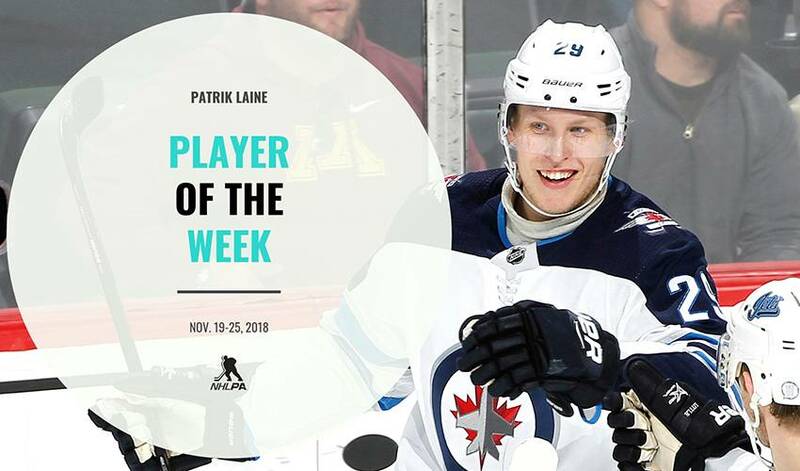 Laine netted his first hat trick of the week, and sixth of his NHL career, as the game's first star in a 6-3 road win over the Vancouver Canucks Monday night. Entering the matchup Winnipeg boasted the most successful powerplay in the league (32.1 percent) and Laine, who before puck drop had seven of his eight goals on the season come with the man-advantage, struck at even strength each time. "I'm not going to say it out loud, but obviously it's bothering you because you're not producing 5-on-5," Laine said postgame. "But when you stay patient and work hard, you are going to get rewarded like I got rewarded tonight. Just being patient, that's the key, and from now on, if I don't score in the next 20 [games] 5-on-5, I am not going to lose it, I am just going to stay patient and keep working hard." The shoe was on the other foot Wednesday for the visiting Jets in a 6-3 loss to the Calgary Flames. Laine scored in the second period to halt a run of five straight goals by Calgary in the opening frame and helped the Jets cut the lead to 5-3 in the third period before a goal by Derek Ryan sealed the deal for the Flames. Laine, who tallied a game-high six shots on goal while skating in 21:00 of ice time had his efforts recognized as the game's third star. Laine extended his point streak to four games Friday with the opening goal in a 4-2 loss against the Minnesota Wild at Xcel Energy Center. The tally was his sixth goal in just three games. Five times he shot, five times he scored. Laine netted his second hat trick of the week as part of a dominant five-goal performance Saturday in St. Louis that saw him score 11 goals in a four-game streak. "The funny thing is, it seemed like he was always open tonight," Jets teammate Bryan Little, who assisted Laine on four of his goals, said postgame. "Whenever he got it, he had a lot of time with it. You can't give him that much time. He's got one of the best shots in the league. It's fun to watch, that's for sure." Though Laine himself credited teamwork for ending the four-game road trip on a high note. "It's easy to play when you're on a winning team, so I have to give some credit to my linemates [Little and Kyle Connor] and obviously our power play," said Laine. "I think our line played very good hockey this road trip." No. 29 drew recognition from his opponents that night too. "His shot is that good," said David Perron of the Blues. "The one-timer on the powerplay, it seemed like no one knew in the rink that it was in the net. It's a special shot, but at the same time, we've got to play him a lot harder. It's almost like we respected him too much." With his seventh NHL career hat trick, Laine became the player with the second-most in league history before the age of 21, trailing only Wayne Gretzky's 12. Just one shy of his 100th NHL goal, Laine looks to become the seventh player in NHL history to reach the mark before his 21st birthday. He can do it in front of a home crowd this Tuesday when the Jets welcome the Pittsburgh Penguins to Winnipeg for puck drop at 8 p.m. ET.